This painting depicts an imaginary incident in the English Civil War during the Seventeenth Century. A couple loyal to King Charles I hide documents which could incriminate them or other loyalists from Roundhead soldiers marching in the distance. The letters could be from the King himself. The viewer is left to ponder whether the documents are waterproof or not. Lexden Pocock was born in London and studied at the Slade School of Art and the Royal Academy of Art. He later studied and taught art in Rome. 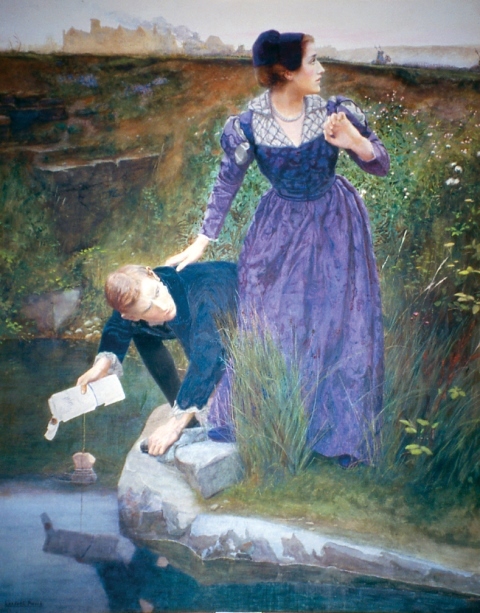 The predominant influence on Dangerous Documents is Pre-Raphaelitism shown in the clear treatment of naturalistic details and the romanticised poses of the figures. Petrus van der Velden was one of the most significant artists in Nineteenth Century New Zealand. He was born in Rotterdam, Holland and studied art there and in Berlin. In 1890 he left Holland for Christchurch where he taught art. He briefly lived in Sydney before returning to New Zealand where he lived until his death. 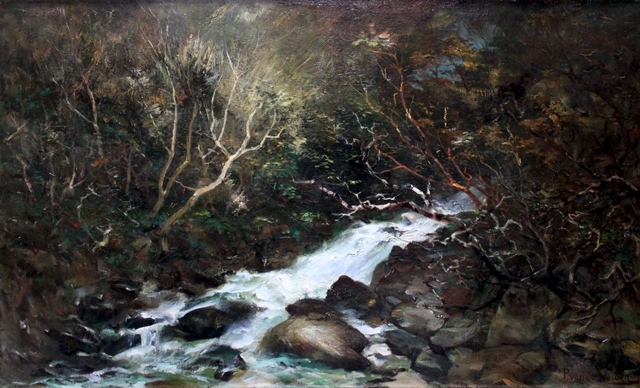 Bush Creek, Taramakau is typical of the sublime, moody Otira paintings van der Velden is renowned for. He first encountered the dramatic Otira landscape in 1891 and returned there for painting inspiration throughout his career. In the Seventeenth Century many Dutch artists travelled to Italy as part of their training. 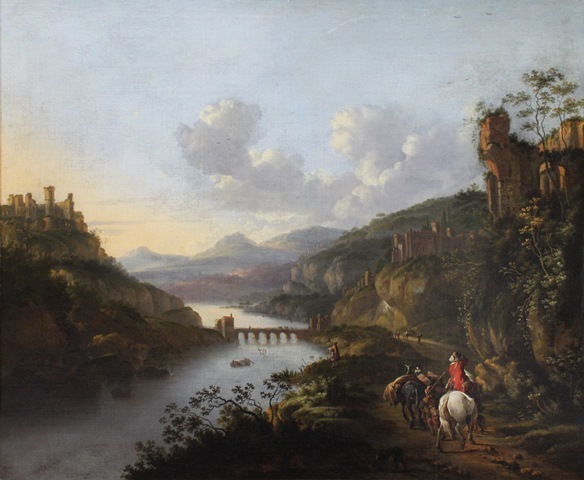 The viewer is drawn to contemplate the destination of the traveller in the red coat as he rides along the winding road with plenty of luggage, among castles on either side of the river. The man leading the donkey in this painting is thought to represent John Simpson (1892-1915) who was born in England, but moved to Australia. He was a stretcher-bearer and is said to have come up with the idea to retrieve wounded men from the battlefield and to take them on a donkey called ‘Murphy’ down to the beach for medical help. This was a dangerous and brave task; he was shot dead on 19 May 1915 aged 23 while helping a wounded man. However the man in this painting is certainly a likeness of Richard Henderson, a New Zealander, who took over after Simpson’s death. 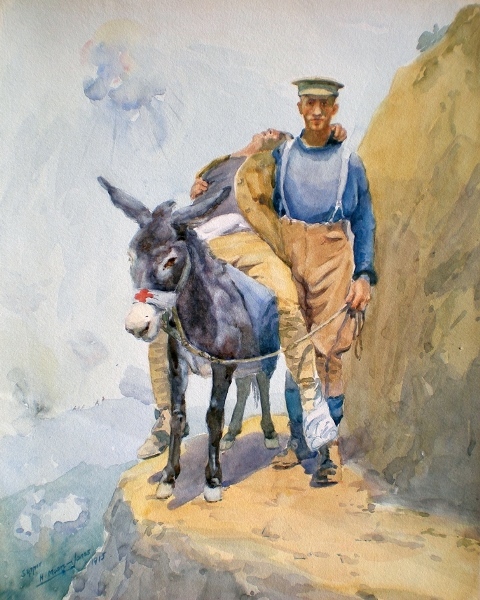 It is possible that Moore-Jones painted the first version of this painting after seeing a photograph of Henderson at Gallipoli helping a wounded man on a donkey - a photo taken by James Jackson of Dunedin. Moore-Jones may have believed that the photograph was of Simpson. Five similar versions are known to exist of this painting. Olivia Spencer-Bower was born in England. She received her early art training from her mother, Rosa Spencer Bower (1865-1960), a New Zealand-born artist who had studied painting in Europe. The Spencer Bower family immigrated to Canterbury after World War One. After receiving a Diploma from the Canterbury College School of Art in 1929. Olivia Spencer-Bower travelled to further her studies at the Slade School of Art in London. 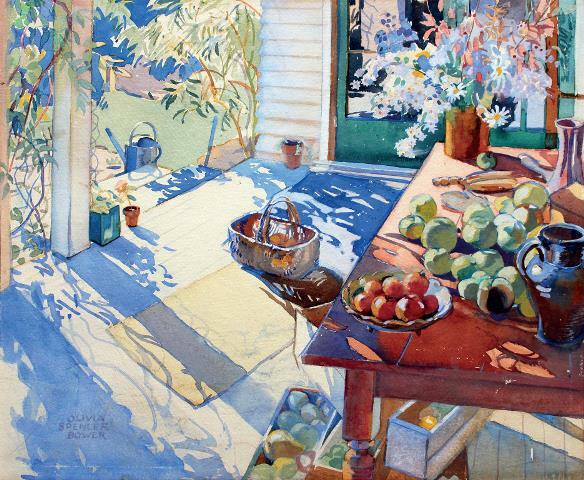 In 1931 she returned to Christchurch and began exhibiting. Before her death, Olivia Spencer-Bower established a foundation that finances an annual scholarship for emergent painters and sculptors to work full-time for one year. Sir Mountford Tosswill Woollaston was born in Taranaki. He studied at the Canterbury School of Art and the Dunedin Technical College where he was taught by R.N. Field (1899-1987). He was knighted in 1979 for his services to painting. Woollaston was particularly influenced by the formalist theories of Paul Cézanne (1839-1906). 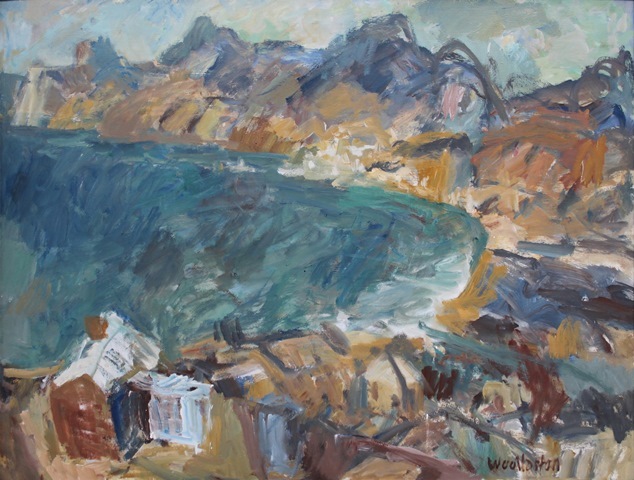 Woollaston painted in an expressionist style; producing a large number of paintings inspired by the Nelson and Greymouth landscape, regions in which he lived for a number of years. In 1976 Colin McCahon painted a series of three paintings entitled 'The red ones'. One of these paintings, shown above, is held in the Aigantighe Art Gallery Collection. 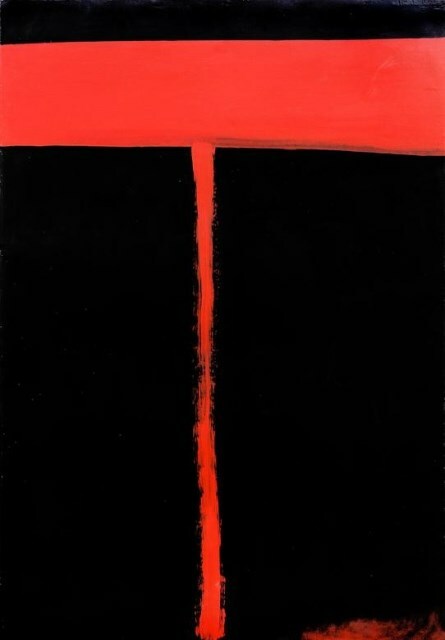 Red and Black makes reference to earlier works based on the North Otago landscape. McCahon also refers to his previous 'Waterfall' series with the vertical line running down the painting symbolising water from a rock or light penetrating darkness.